Completely protected from the weather and elements, this Laminated Padlock is totally sealed so it won't freeze up or corrode. 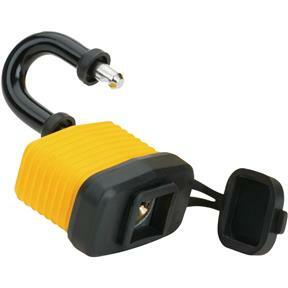 A rubber cap allows access to the keyed lock. Steel laminated construction and double lock ensures maximum security. These laminated padlocks measure 1-1/4-inch wide. I haven't put it to use yet looks to be good quality.